This month, I had a fun new assignment called the Secret Recipe Club. Food bloggers sign up, then we are each given a secret assignment to make one recipe from another member’s blog. And today I’m baking more healthy oats into desserts! Don’t these Pumpkin Oat Streusel Muffins above look good? I’m glad I got Delicious Existence so I could choose another baked-oat-dessert: Cinnamon Raisin Oatmeal Pie with Dark Chocolate Drizzle. Danielle is a passionate holistic health counselor and dedicated vegan and gluten-free cook…something I’ve never tried. I thought this would be an interesting test: can I successfully make this recipe, only shopping at my local grocery store? Some of the ingredients were hard to find, so I substituted agave nectar + organic sugar for sucanat, dried cranberries for raisins (just for fun) and I couldn’t find oat flour that was gluten-free. I also added a quarter cup of organic sugar and a teaspoon of sea salt before pouring it into the baking dish, above. After baking, the consistency more resembled scones, which Danielle does mention in her recipe. These would be great with no topping, just served warm topped with a little butter. I did have some trouble with her recipe for the glaze, so I ended up using a technique from Toll House, melted in a baggie and squeezed out in a drizzle, as shown in the video above. Watch here to see how it’s done. It was still a very healthy recipe that I can feel good about for a treat or for breakfast, above. And it’s pretty! 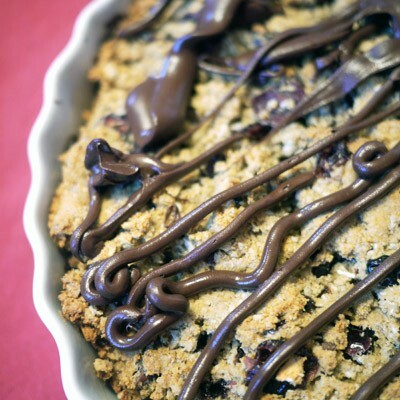 This got me thinking about our own recipes, so i found some healthier dessert options with oats. One is Pumpkin Oat Streusel Muffins, shown at top. Another is this recipe for Good-For-You Choc-Oat-Chip Cookies, above. Looks great — so fun to be in SRC with you! So would this be considered breakfast or dessert? The only time I do chocolate for breakfast is if I use a chocolate protein powder for a smoothie.. so I guess this could be breakfast? It honestly looks really delicious and a fun twist for breakfast or dessert! OMG – I am loving your post and I am glad you enjoyed the recipe!! You are so right in terms of some ingredients being difficult to find in your standard supermarket. I tend to order alot of stuff online (at vitacost – they have the best prices) as well as shopping at Trader Joes and when I must Wild by Nature (the prices arent that great but they have a bulk bin section so I can just buy what I need instead of purchasing a whole bag. It helps keep costs down as done making my own flours when I can. I do this with oat flour via grinding my oats in a nut/seed/spice grinder).